Ridgeway Racing Engines was founded in 2010 by Paul Broadway, after a 20 year stint at Swindon Racing Engines. Paul was keen to focus solely historic motorsport and was quickly joined by other members of SRE who shared his passion for historic motorsport - some of whom have over 40 years experience in race engine building. Since then, we have become well known for building highly tuned race engines and manufacturing some of the finest engine components available for historic motorsport. 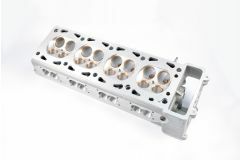 Our engines and components are renowned for their engineering quality and race winning potential. Being a small team, we work very closely with our customers to understand their requirements and are able to respond quickly to develop solutions which address their needs. Experts in building Cosworth/Ford DFV & BDG, Lotus Twin Cam, BMW M12 and Toyota Novamotor engines, we focus solely on Historic Touring Cars, Saloons, F1, F2 & F3 and supply customers worldwide. Our dedicated team of engine builders and specialist staff have many decades of experience within Historic Motorsport and it is this detailed knowledge and their exacting standards that will ensure you get the best from your engine. Copyright © Ridgeway Racing Engines Ltd. All rights reserved. Site by Alex Haws.